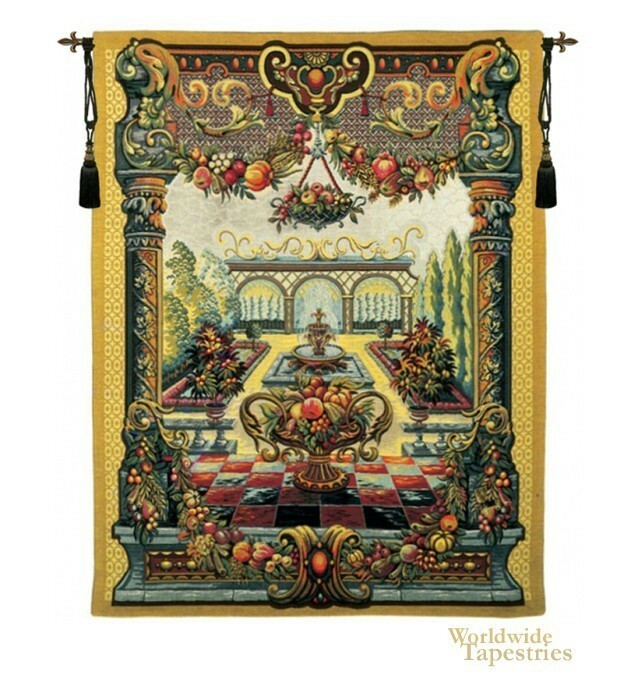 Jardin de Bagatelle tapestry is a fanciful tapestry with in Renaissance style, based on a fresco in the Fontainebleau castle. This tapestry is as luscious as the castle itself which is situated 55 kilometres from the center of Paris and is well known for its large and elaborate gardens and the beautiful forest of Fontainebleau closeby. The garden scene is framed by colonnades festooned with fruit garlands. Delightful in its use of color, this tapestry brings light and color to any room. Jardin de Bagatelle is backed with a lining and has a tunnel for easy hanging. Note: tapestry rod, tassels, and accessories, where pictured, are not included in the price. Dimensions: W 70" x H 92"